Gotha Go 244 (2-Gnome-Rhone 14M) Transport aircraft. Identification/Recognition Poster Issue 1 - October 1943. Approximately 38 x 55.5cm. Printed by Fosh and Cross Ltd. on fairly thin paper. October 1943 print date. 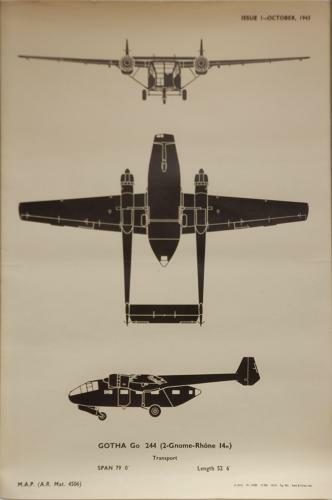 Shows the silhouette of this German Luftwaffe transport aircaft from the front, underside and side. Very good used condition. Not significantly creased or folded but with minor edge tears and dog-eared corners etc. These would have been used in training schools and also found in Mess huts on active RAF bases. Will be posted in a card mailing tube. Stock code P14910.